* Stamp with a friend - make a date of it! A bonding moment! Paper Pumpkin by Stampin' Up! We're your paper fairy godmother(without the white hair). We're your creativity problem-solvers. We design, color, measure, cut it all for you. We've been sweeping away the mundane for 25 years. And, we want to share it all with you. Need paper, ink, accessories? Or just a few fun products? 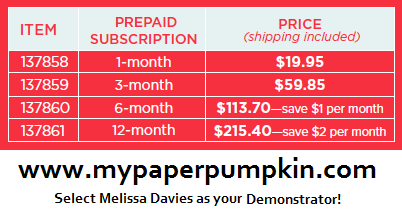 Be sure to select ME as your Demonstrator to get a FREE My Paper Pumpkin Stamp Case! Keep all your stamps and Stampin' Spots together in one place!